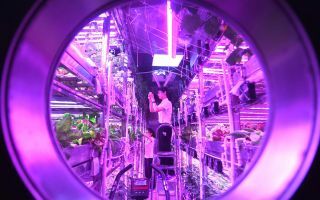 Chinese student volunteers completed a one-year test living in a simulated space lab in Beijing yesterday (May 15), setting a record for the longest stay in a self-contained facility. That test started on May 10, 2017, inside the Yuegong-1 ("Lunar Palace 1") facility at Beihang University and lasted 370 days, according to China's state-run Xinhua news agency. The yearlong trial consisted of three phases; the last of these, which lasted 110 days, wrapped up yesterday. Eight student volunteers took turns living in the cabin, which measures around 1,600 square feet (150 square meters). The BLSS is a critical piece of technology required for long-term human stays on the moon or other extraterrestrial bodies, Liu said. Layout of China's Lunar Palace 1, an Integrative Experimental Facility for Permanent Astrobase Life-Support Artificial Closed Ecosystem (PALACE) Research. Yuegong-1 consists of two plant cabins and a comprehensive cabin. Liu said the BLSS system had functioned well over a long time; the experiment also allowed researchers to explore the mechanisms by which light affects people's emotions and biological rhythms. Scientists also improved technology for vertical planting, the Xinhua story said. "This is not the end, but a new starting point to continue to explore space," Liu said, according to Xinhua. Researchers will evaluate the physical and mental conditions of the volunteers, study test results and explore smaller BLSS equipment, which could be loaded onto space labs and moon and Mars probes in the future. "The test has important implications for human endeavors to achieve long-term stays outside Earth. The experience, technology and findings will be conducive for future space exploration efforts," said Wang Jun of the Chinese Academy of Engineering, Xinhua reported. Construction on Yuegong-1 began in March 2013. The facility was unveiled in January 2014, and it was commissioned just before its first mission, a 105-day experiment that started in February 2014.